Precocious Daughter was eating Whoppers today and wondered aloud how they were made. And I really had no clue. So I Googled it. And I discovered a delightful fact: Malted milk balls are nothing but malted milk powder mixed with melted white chocolate. Holy cow! I can make that! And I'm totally going to. I'm going to make homemade malted milk balls. Hundreds of them. And take pictures. And then I'm going let you know how it went. 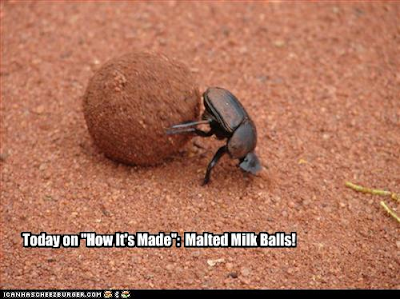 If my homemade malted milk balls turn out great, I'll be very happy. On the other hand, if they turn out crappy, it might make a better story.